Port Douglas is blessed to have the best opportunities for game fishing in the country. The outer reefs off Port Douglas and continental shelf options including Linden Bank, Opal Ridge and the Ribbon Reefs up to Lizard Island are second to none when it comes to landing the biggest of fish available in the southern hemisphere… the mighty Black Marlin. From September to December each year the big Marlin migrate following the bait fish along the east coast right to Port Douglas and beyond to Lizard Island. There are a number of game fishing boats in Port Douglas that offer day charters to hunt for the mighty Marlin. Each specialist game boat has the knowledge, skill and equipment to cater to all your charter requirements and make your game fishing trip from Port Douglas a world-class experience. Port Douglas is world-renowned for its Giant Marlin No other marlin fishing destination compares to the Port Douglas Marlin season. Undoubtedly the reefs from Port Douglas to Lizard Island on the Great Barrier Reef produce the largest Black Marlin available and the most coveted game fishing opportunities possible. Anglers from all over the world travel to Port Douglas during these months for the opportunity to catch a 1000lb Black Marlin, a “grander”, as it is the premier destination for the serious Marlin angler. Along with the highly sought after 1000lb Black Marlin there are also many opportunities to catch Black Marlin around the 800lb plus mark when chartering a heavy tackle game boat from Port Douglas during Black Marlin season. The waters between Port Douglas and Lizard Island boast some of the most exciting Marlin fishing in the world. 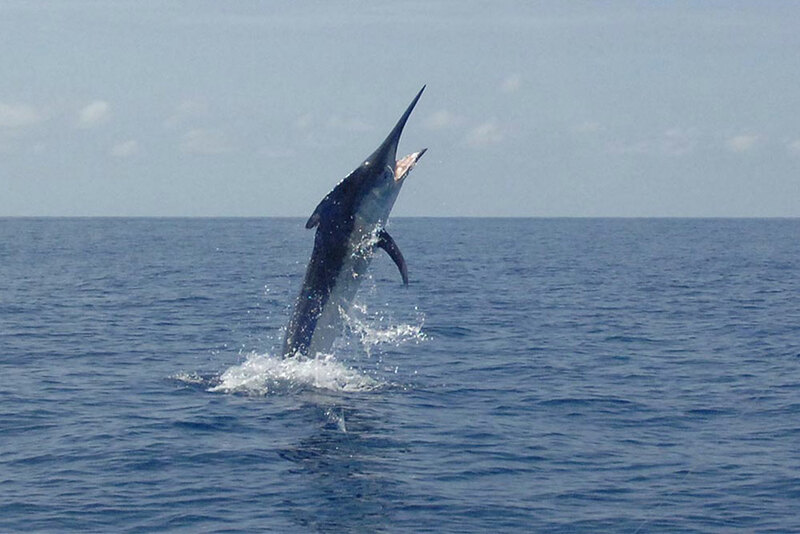 Pre-booking is highly recommended, particularly during the popular Black Marlin fishing season. The famous Lizard Island Classic is held in October, for seven days. To avoid disappointment it is suggested that you book as early as possible for this tournament. The ultimate game fishing charter is to depart on your charter boat from Port Douglas and spend a couple of days cruising up the ribbon reefs to Lizard Island to participate in the tournament. The International Game Fishing Association’s catch records indicate that over seventy per cent of the 1000lb plus Black Marlin caught and weighed in the WORLD are caught in the stretch of reef between Lizard Island, the Ribbon Reefs and Port Douglas. This marlin rich fishing location is a relatively small area, around 150 miles of reef edge. This is where the big female marlin come to spawn between September-December each year. If you want to just target giant Black Marlin on a boat charter from Port Douglas then a day trip will allow you access to Linden Bank. Linden Bank is a Black Marlin fishing location where dreams are made. It is one of the legendary prime Black Marlin fishing destinations accessible from Port Douglas. The Black Marlin fishing trip of a lifetime would have to be to charter a mother ship from Port Douglas so that you can fish from dawn till dusk and still have all the comforts of a 5 star luxury hotel on the water. Luxury mother ships can comfortably sleep larger groups and have all the mod cons aboard. You can also charter a smaller game fishing boat from Port Douglas to fish for the Black Marlin during the day. After an adrenaline filled day of game fishing, return to your big comfortable mother ship and relax at the bar, while the on board chef whips up a splendid feast for you to enjoy. If you have a group of friends and you charter the mother ship together you can mix up the activities a lot, do some bottom fishing or popper fishing during the day, a spot of spear fishing or cray fishing, some diving or snorkelling or even just relax on board, the choice is yours. Go your own way. Marlin Fishing is best done by sole charter. There are no shared Black Marlin fishing charters from Port Douglas. This entry was posted in Fishing, Great Barrier Reef, Port Douglas News and tagged adrenaline, billfish, boat, charter, grander, heavy tackle, marlin, Penn Reels, Port Douglas, Shimano, tournaments.